On 12th June a large group of 40 volunteers came together on behalf of DH Foundation; a registered UK charity whose mission is to work towards alleviating poverty in Bangladesh. 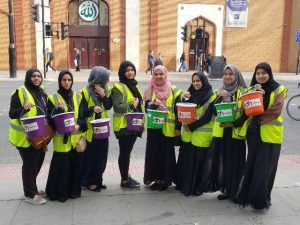 They held a street collection in the borough of Tower Hamlets, covering the main areas; Mile End, Whitechapel, Aldgate, Bethnal Green, Bow and Stepney Green. The volunteers started fundraising at 10am through to 9pm, they managed to surpass their target and raised nearly £4000. The main purpose of the street collection was to collect donations for the most poor and needy people in Bangladesh. The collection enabled DH Foundation to deliver basic food rations, aid and medical assistance. As they are a relatively small charity, this street collection facilitated the exposure and awareness they sought, thus attracting an audience to join them in helping tackle poverty in one of most destitute areas of the world. Mohammed Imran, Chairman of DH Foundation said: “Truly amazing team work and effort by the DH Foundation team and volunteers.” “They worked extremely hard in hot weather conditions whilst most were fasting, this is a great achievement. 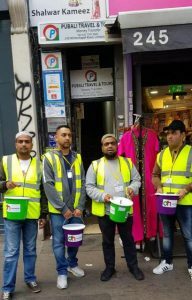 So proud of the team!” The charity had previously conducted a street collection in borough of Newham a few months ago raising another 4K in aid of Rohingyan people who were fleeing Burma and entering the country across the Myanmar border. DH Foundation is a UK registered charity and established in 1997 by a group of young people determined to make a difference to the lives of those afflicted by poverty and suffering in Bangladesh. To achieve their vision, DH Foundation undertook regular programme of action and activities aimed at not only providing immediate relief to the poor and needy but will also address ways in which they could become economically active and self-sufficient in the long term.